Houseboat Bed and Mattress - How to get the sheets on, in a cuddy cabin? Houseboat bed and mattress in a cuddy cabin. We have a houseboat bed and mattress in a cuddy cabin that are very hard to make. Any ideas how to put the sheets on easily? We have a Fun Country houseboat with four queen size beds. Two beds are in cuddy cabin and two are in room by itself. How do you put the sheets on these mattresses when you cannot walk around the bed. The mattresses fit up to the wall on three sides. Well Richard, welcome to the houseboat forums, and sorry to hear about the difficulty with the bed sheets. You are not alone, as we also have the same problem. 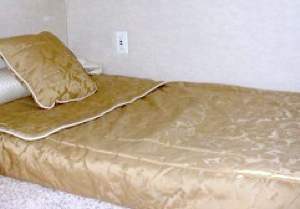 When a bed is touching all three walls, which is common in RV's or Trailers, and also many Boats, the tempers will flare. It's really hard to "make the bed" since you have to climb on the bed, yet be able to put or pull the sheets into the two back corners. corner, we find that by tugging and pulling up the corner of the mattress helps immensely to get things started. The trick is to start in the two back corners, and not kneel on the bed-sheet at the same time. I am sure that this post will hit a nerve with many houseboat owners that have a hard time making the bed on those mattresses that are blocked on three sides. Lastly, hopefully some of our readers will share and post comments about their houseboat mattress, bed-making, techniques or experiences. Feel free to use the "Click here to post comments." link found near the bottom of this page. Comments for Houseboat Bed and Mattress - How to get the sheets on, in a cuddy cabin? We bought 3" foam mattress toppers. They make it the easiest way. We got so tired of trying to make those darn beds we finally did the right thing and got rid of the Wall! And lowered the beds to floor and now have no downstairs beds all storage and 2 beds we can make. Oh we also got rid of the closets 1 down in old 2 queen bed cubby. It's a cuddy, put the kids in a sleeping bag!!!! The easiest way for me was to use a spatula. Doing the back first using the spatula to slide the sheets down then the front. I also found it easier not to use fitted sheets. Hope this helps. I am not sure how practical this is for most folks, but I pull my top mattress off the bed...standing it on end... or its side..... placing the fitted corners on the opposite side and then laying it back down and placing the other corners on once I have slid it back in place. Get one piece sheets, top and bottom, with elastics. Check out your local RV supplier. I have bed sheets that are made of one piece (top and bottom together), and they are sized to the mattress, and only the elastic bands go around the ends. Or if you're really crafty, you can make your own. Sara. Well Sara, welcome to the houseboat forums, and thanks for sending in this great tip. I am sure that my wife will be looking into these sheets. Yeah, welcome to boating. It can't be done without cutting the outside bulkhead out. That lets some water in so it's not a good idea. Then there is the ever favorite "get a bigger boat" thing. Don't work either! I'm up to 57 feet and the bedsheets are still getting to be a sore spot. "A man's solution" would be, "Why change them?" Not a good answer in front of the wife. Helping the way Ian said is about the best answer there is. I'm thinking of changing the staterooms into storage rooms and putting a king size bed in the living room. It would get me untold points and maybe even save me from getting a bigger boat again next year. Russell. Have you tried the stretch knit t-shirt sheets. We don't have a houseboat yet, still in the looking stage, but we do have a motorhome with a couch that makes into a bed that poses the same problem. Those stretchy sheets make it alot easier to work those corners on.